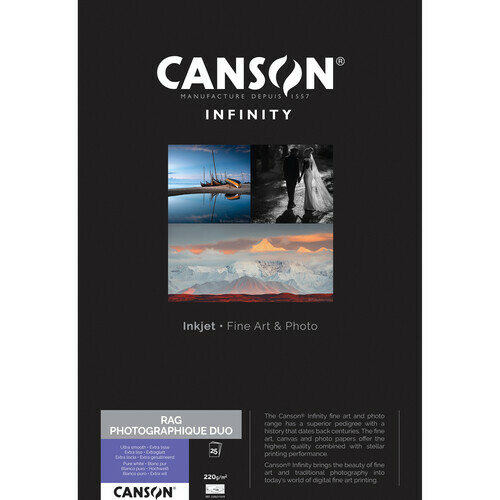 Taking cotton rag to the next level with a double-sided coating and a smooth matte surface with an exceptional Dmax, Rag Photographique Duo Paper from Canson Infinity will satisfy fine art photographers and printmakers looking for a spectacular double-sided museum-grade media. This 220 gsm paper is available here as a 25-pack of 8.5 x 11" sheets and benefits from a 100% cotton rag base with a thickness of 13.8 mil. It achieves a smooth white tone of 89.67% by introducing natural minerals to the process and avoiding any OBA content. The paper is also acid free and internally buffered for longevity and benefits from instant drying and a high water resistance to ensure no damage during handling. Box Dimensions (LxWxH) 11.5 x 9.0 x 0.7"
Rag Photographique Duo Paper (8.5 x 11", 25 Sheets) is rated 5.0 out of 5 by 1. Rated 5 out of 5 by Gregory from Canson Papers For my serious printing needs, Canson papers are fantastic! I was wondering if this paper is short grain or long grain. All Canson papers are long grain.